The good folks at GFI have given us yet another great tool and the best news is it's free. Ever wonder who's doing what on the web tying up all that bandwidth? Well here is a way for you to find out, from anywhere on the network. It is called "WebMonitor for ISA Server" and is a free download from http://www.gfi.com/webmon/. You know GFi the company that makes MailEssentials, FaxMaker and MailSecurity. GFiWebMonitor for ISA installs in under a minute as a Web Filter and self configures. It does require a restart of the Web Proxy Service however you will not need to reboot the server. 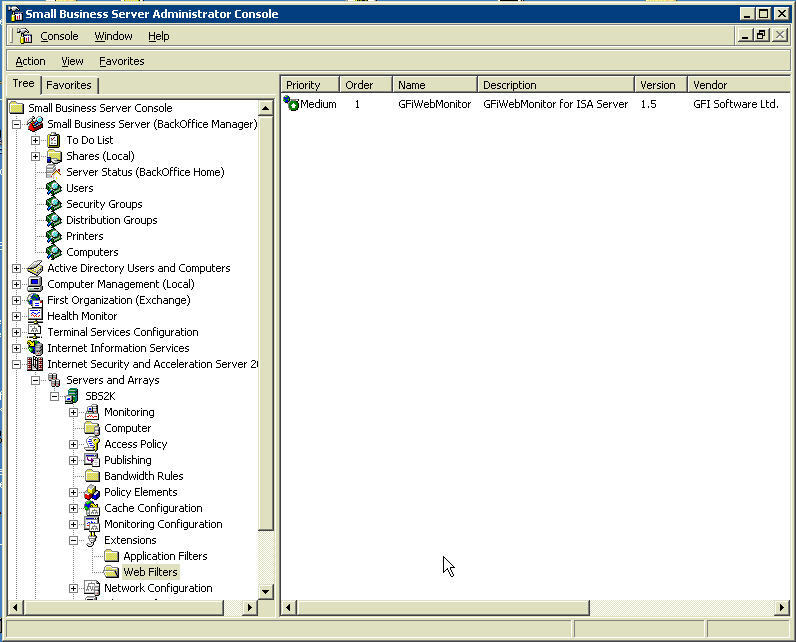 Although shown below on Microsoft's Small Business Server it will install on any ISA 2000 server. What is GFI WebMonitor for ISA Server? GFI WebMonitor for ISA Server is a utility for ISA server that allows you to monitor all current connections active on ISA server. Use it to check what files users are downloading or what sites users are visiting. You have Windows 2000 server and Microsoft ISA Server 2000 installed and running. The web proxy service of ISA Server is installed and running. Step 1: Run webmon.exe on the ISA server machine. Step 2: Restart the ISA server web proxy service! This can be done from the ISA server configuration: Servername > Monitoring > Services > Web proxy service. Note that when you do this all currently connected users will be disconnected! After installing and restarting the web proxy service, you can now access the GFI WebMonitor from anywhere in the network. You must have administrative rights AND BE AN AUTHENTICATED USER ON ISA SERVER to be able to access the GFI WebMonitor. Type http://monitor.isa to access the GFI WebMonitor. The GFi WebMonitor shows you all active connections whether to web pages or file downloads to help you track down that bandwidth hog. I am sure you can see the value of this tool, and you must admit the price is right. While you are at GFi take a look at some of their other fine products. And yes there are even more free tools on their website!